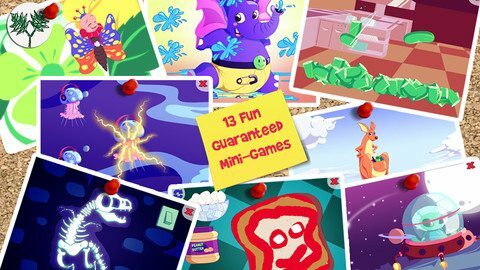 Animals Flip and Mix is a nice quality app that encourages creative play in a child-safe environment; potentially improving a number of skills along the way. This app combines top quality design elements creating an atmosphere where kids can focus on fun. Narration is easy to understand and can be repeated, graphics with vivid colors and the lively music are just a few of the elements included. Navigation and ease of use are also important features; this app hits the mark on both. It will not take kids long to figure out how to use this app. On the left side of the screen the user has three word parts; on the right, three pictures that are associated to the word parts on the left. The user can change the parts to make silly words or characters or combine them correctly to gain access to a mini game. The user is able to hear the entire word, or any part of it, spoken; repeating it as often as desired. Thirteen words are available; words such as strawberry, crocodile, butterfly and jellyfish. These are not words commonly found on spelling tests for the target audience of 4-7 year olds, but then the app is more for fun than education. This app could be used to improve fine motor, matching and language skills. Kids and adults are likely to giggle at the crazy character and word combinations. The characters are marvelous and are a big part of the entertainment. Animals Flip and Mix leans more towards entertainment than education; however, parents love when we can give our kids apps that are both. The app contains 13 mini games which are accessible when the correct combination is lined up. Mini games include activities like slicing cucumbers, filling a ketchup bottle, making a peanut butter sandwich with jelly and marshmallows or singing along to the alphabet song. While this app offers creative play and educational opportunities, additional content is needed to extend the staying power of the app on our devices. Animals Flip and Mix is a very nice quality universal app that works nicely on the different sized devices. Universal apps that work well on multiple devices make the price more budget friendly for families. Consumers are looking for quality apps offering a substantial amount of content, whether for education or entertainment, so by adding more content (without increasing the price) it would make this app a real stand out. This app provides not only an entertaining environment for creative play, but a safe one. The developer deserves a round of applause for making this a safe place for our children to enjoy. The additional apps menu is protected and the app does not contain any in-app purchase, ads or those other items we do not like in apps for kids.